Girl Scout Cookies are a time honored tradition, and more popular than ever before. Good news for those who just can't get enough of the delicious treat. General Mills is releasing not one, but two, different breakfast cereal flavors based on the long-standing snacks. And you won't have to wait for your local Girl Scout troupe to show up at the supermarket to get them. A vast majority of Americans love to get their hands on boxes of Girl Scout Cookies when that time of season rolls around. But now, those same snack food fans will be able to tear into either a box of Thin Mints cereal or Caramel Crunch. These two different breakfast cereals will be in stores starting January 2017. Confirms Mike Siemienas, Manager of Brand Media Relations for General Mills. "The Girl Scouts Cookie cereals will be available nationwide in January!" At this time, General Mills is staying quiet about exactly what they are planning with their Girl Scouts cereals outside of the two flavors. 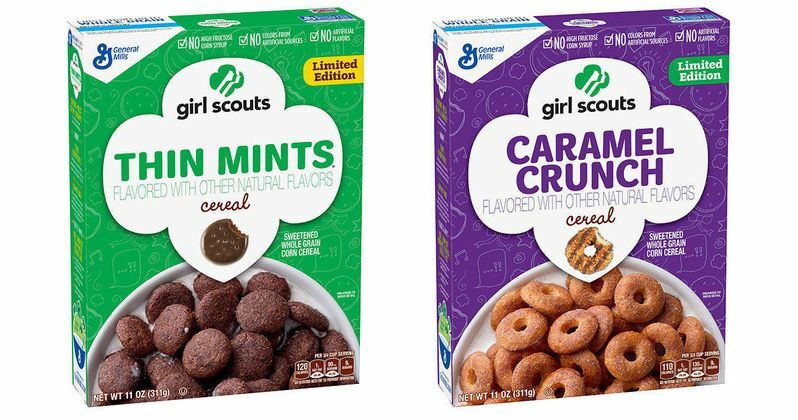 They did, however, reveal the boxes for these cereals, with the Thin Mint flavor coming in the appropriate Mint Green colored box, and the Carmel Crunch coming in the signature purple Samoas box. Why the cereal isn't called Samoas is anyone's guess, as it either has to do with trademarks or the fact that some individuals unfamiliar with Girl Scout cookies wouldn't know what they were getting themselves into. If you plan on snacking down on a couple boxes of Girl Scout Cookies cereal, you better act fast. These flavors will only be available for a limited time. As for the flavor choices, the official Girl Scouts of America website notes that Thin Mints are their most popular and best selling flavor of cookie, followed closely by the Samoas, which is also known as Caramel deLites. It was this time last year that General Mills announced that they were releasing Batman V Superman cereals in two flavors, but those two breakfast-eating superheroes will now have to make their way for these latest flavors of sweetened whole grain corn cereal. If they prove to be popular, perhaps we'll see Savannah Smiles, Tagalongs, or Do-si-Do flavored cereals in the new year.